With the help of eSpark, Beavercreek City Schools integrated personalized learning with 1-to-1 iPads to engage K-8 students, empower teachers, and increase academic achievement. Outside of Dayton, Ohio, Beavercreek City School District was designing a district-wide 1-to-1 iPad deployment in December of 2013. The district was one of a handful in the state to receive a grant from Ohio’s Straight A Fund to help schools launch creative new ideas for improving education. Dr. Susan Hayward, current Assistant Superintendent of Beavercreek and former Director of Curriculum and Instruction, proposed a strategic initiative that would use the Straight A funding to individualize instruction for kindergarten through eighth grade students with the use of technology. The district was striving to find tools to help teachers deliver meaningful instruction to every student—from the high performers to those that were falling behind. “Our goal is to meet the needs of all students. We want all students to grow, and we want to be able to look at their strengths and weaknesses and provide individualized instruction,” explained Dr. Hayward. "Our goal is to meet the needs of all students. We want all students to grow, and we want to be able to look at their strengths and weaknesses and provide individualized instruction." During extensive research, Dr. Hayward learned about a program that would complement traditional classroom instruction to ensure students’ unique learning needs were met in a fun and engaging way. While partnering with eSpark Learning meant that all students would have apps, e-books, and quizzes aligned to their needs, it also meant that Beavercreek had a partner in the design and deployment of a 1-to-1 iPad initiative for over 5,000 students in kindergarten through eighth grade. "I’ve had my high kids really feel like they’ve been challenged. They’ve had to really think on their lessons, and that may be the first time they’ve felt pushed to do their best." Because eSpark relied on every student’s NWEA MAP assessment scores to set appropriate learning goals in math and reading, struggling learners streamed iPad content that would help them close the achievement gap while high performers were academically stimulated in ways that were never possible with whole group instruction. “I’ve had my high kids really feel like they’ve been challenged. They’ve had to really think on their lessons, and that may be the first time they’ve felt pushed to do their best,” stated Nichole Deschapelles, fourth grade math and science teacher. Following the successful spring, the full deployment plan continued in high gear. As Beavercreek had elected a 1-to-1 initiative, over 5,000 iPads arrived over the summer that needed to be properly configured to allow for personalization. Going from managing a couple of hundred devices to over 5,000 in a few short weeks is no easy task for school technology directors. Mike Shuman, the district Director of Technology and a graduate of Beavercreek, needed a solution to help his technology team launch and manage the incoming thousands of iPad minis that were acquired with the grant funding. Over several days, the eSpark staff went onsite and teamed up with Mike and his technology staff to set up all devices with the help of Apple’s Device Enrollment Program and Orchard, eSpark’s wireless Mobile Device Management solution. These two programs allowed Beavercreek to deploy 1-to-1 iPads at scale with personalized apps for each student. "The process went very smoothly," explained Mike Shuman. "The entire [eSpark] team was very productive, professional and fun to work with… eSpark really has fulfilled the role of being partners with our technology team to ensure the system runs as smoothly and reliably as possible." Several tech-savvy teachers submitted applications in hopes of being appointed Lead eSpark Teachers. Each elementary and middle school was represented by one Lead to help peers achieve smooth technology implementations and communicate ideas or concerns back to the building and district leadership. All 350 K-8 teachers attended a comprehensive professional development session in late August to understand the ins and outs of iPad instruction, how to incorporate eSpark, and the additional opportunities for ongoing training and support during the school year. In early September, all students completed the NWEA MAP assessment. With the performance data collected, each learner was quickly diagnosed and began working on a differentiated learning plan before the end of the month. Teachers attended a second professional development session one week later focused on monitoring student growth and reviewing student videos. With robust training and tangible tips, they felt confident in their ability to utilize the iPads and eSpark three times per week during both reading and math time to achieve maximum learning potential. The technology team also wasn't neglected after initial deployment. "The constant, reliable availability of all levels of support is the greatest benefit eSpark provides our technology department," commented Mike Shuman. As a leader who views technology as a tool to enhance instruction, he proclaimed, "eSpark is a perfect example of how technology can be used to help individualize education, and educators can’t possibly take the time to create a system like this on their own while still teaching and managing a class." K-8 students using eSpark grew an average of five percentile points. As typical yearly percentile growth is expected to be zero, these results indicated that differentiating learning through technology integration had a profound impact on student achievement at Beavercreek City Schools. As the first year of the full implementation came to a close, students once again were assessed with adaptive, nationally-normed MAP testing. 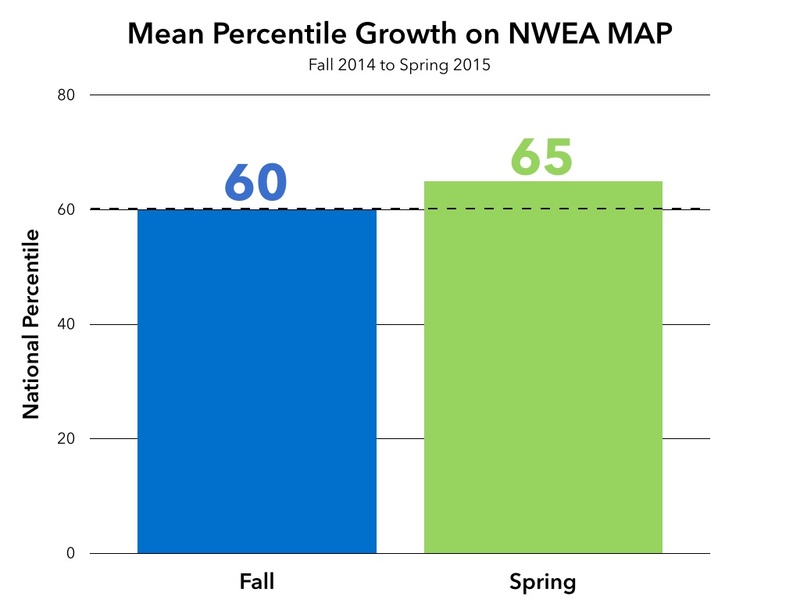 From Fall 2014 to Spring 2015, K-8 students using eSpark grew an average of five percentile points. As typical yearly percentile growth is expected to be zero, these results indicated that differentiating learning through technology integration had a profound impact on student achievement once again. Further analysis revealed that students achieved an average of 100% of their expected annual growth in areas not targeted by eSpark, demonstrating the amazing work of Beavercreek’s excellent teaching staff. In eSpark goal domains, however, students achieved an average of 161% of their expected growth and exceeded expectations. 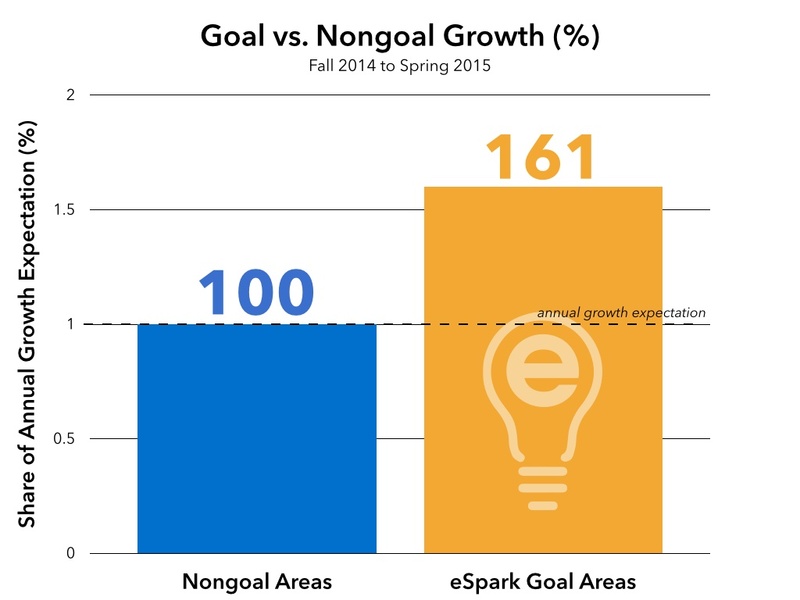 From Fall 2014 to Spring 2015, K-8 students using eSpark grew an average of five percentile points. As typical yearly percentile growth is expected to be zero, these results indicated that differentiating learning through technology integration had a profound impact on student achievement at Beavercreek City Schools. Given the remarkable progress, students had the option to take the iPads home over the summer and continue the program momentum before beginning once again in Fall 2015 with the addition of pre-kindergarten participation. “A parent spoke to me and shared with me that her child has been struggling in math. When she heard that her child had the opportunity to take eSpark home over the summer and continue working with the math [content] to develop that knowledge base, she was in tears because she finally found something that she felt her child would be successful with and learn and grow,” stated Dr. Hayward. Beavercreek City School District’s success in integrating personalized learning in the classroom sets a new standard for the kind of lasting change schools can achieve at scale and eSpark celebrates this innovative coOmmunity of students, teachers, school leaders, and parents.